I wanted to go to a baseball card show. A real show with more than a few tables of rookie and "game-used" cards. I wanted to go to a show where I could look through a stack of T206s or 1948 Leafs or anything older than 1980. A recent google search turned up the Frank & Sons Collectible Show in the City of Industry near Los Angeles. It's a twice-a-week show that has much more than sports stuff. After a two-hour drive, I found myself at a large warehouse filled with collectibles from Japanese animation art to action figures to comic books. Oh, and there were a few dozen dealers with baseball cards. I picked this card up at the first booth I stopped at. I asked the dealer for poor old baseball cards and he pulled out a stack for me to thumb through. I eventually bought the whole stack for $70. There must have been well over 100 cards from the 50s, 60s and 70s. They included Warren Spahn, Hank Aaron, Nolan Ryan, Pete Rose, Yogi Berra, Stan Musial and Whitey Ford. There were even a dozen or so 1952 Topps cards, each trimmed down with scissors. Too bad. It seemed as if the dealer just wanted to get rid of the beaters. And I was happy to take them off his hands. A few tables down, I asked another dealer if he had any poor old baseball cards. He seemed quite shocked that anyone would want what he termed "junk." Well as the saying goes, one man's junk is another's treasure. He asked me why I collected the "junk." He wasn't being a jerk, he really seemed curious as to why I wanted those cards. He then turned to his partner, who I think was his dad, and said: "Show him that card." The older man pulled out a 1954 Topps Jackie Robinson that was truly deserving of this blog. It was torn, taped, wrinkled, scraped and just plain worn out. The young man's next words were: "It's not for sale." Funny how the duo was selling thousands of cards behind glass with pricetags but this one card was "not for sale." Obviously that card had some meaning to the old man. I wanted to but I didn't say it: "That's why I collect poor old baseball cards." 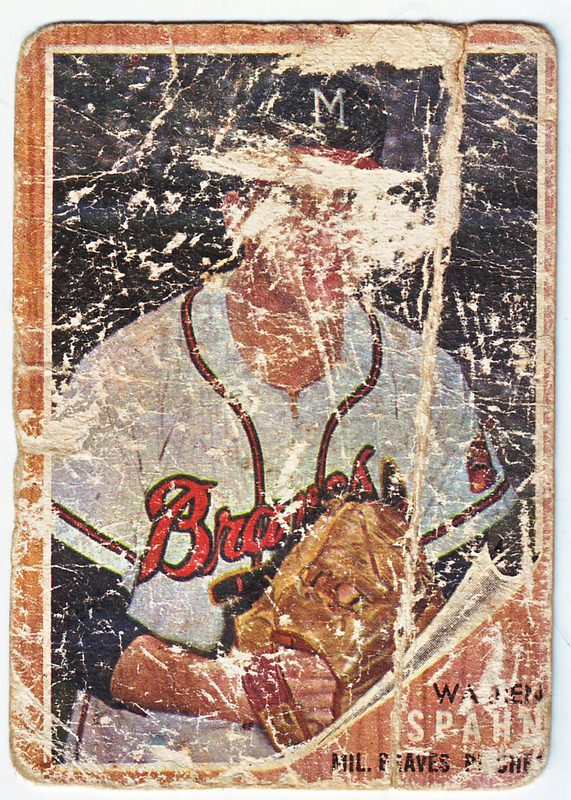 OMG, that's the most fantastically poorest old baseball card of all poor old baseball cards! Would've loved to see that Robinson. Keep on keepin' on collecting your POBC's, I enjoy the stories. Let me see if I got this right. You buy low grade beat up cards and feature them on your blog. That's awesome. Totally different than all the other blogs I have seen featuring the nicest cards. Worst I've ever seen. Nice pickup.